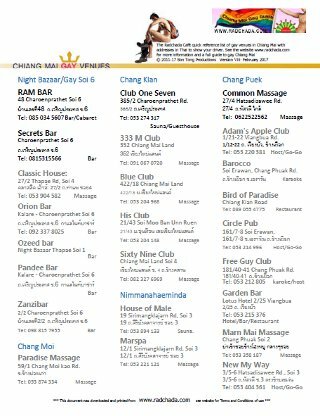 The term gay-in-chiangmai.com or ‘us’ or ‘we’, or any of the related domain names listed below, refers to the owner of the website who can be contacted at Bon Tong Productions based in Gateshead, United Kingdom. The term ‘you’ refers to the user or viewer of our website and “your” use thereof. Our website is a non commercial service providing information and entertainment to the gay community in various parts of the world. Whilst it may discuss gay themes it is not our intention to include any sexually explicit or pornographic information. If you were looking for such information, or if you find gay themes offensive please search elsewhere. Whilst we endeavour to keep the information up to date and correct, we make no representations or warranties of any kind, express or implied, about the completeness, accuracy, reliability, suitability or availability with respect to the website or the information, products, services, or related graphics contained on the website for any purpose. This website may provide information about third party businesses or services, this information is provided to assist you in making informed choices about places to visit or services to use. The information has not necessarily been checked with the business owner or service provider and does not necessarily represent either their views or mean that the business or service is recommended or endorsed by us. The contents of any files, images, user comments, guest book entries or other materials accessed by the User through this website do not necessarily reflect the views or opinions of Bon Tong Productions. No inference regarding sexual orientation or involvement in any sexual activity may be made from the appearance of any person in any image obtained through this website. From time to time, this website may also include links to other websites. These links are provided for your convenience to provide further information. We have no control over the nature, content and availability of those sites. They do not signify that we endorse the website(s). We have no responsibility for the content of the linked website(s). Users may not post comments of a homophobic nature, or intended to be offensive to gay people, or which break any applicable laws. In no event will we our employees, contractors, licensees, agents, and associates be liable for any loss or damage including without limitation, indirect or consequential loss or damage, or any loss or damage whatsoever arising from loss of data or profits arising out of, or in connection with, the use of this website including without limitation, any failure of performance, error or omission whether for breach of contract, tort, negligence, or by any other cause whatsoever. All contents Copyright © 2007-2019 Bon Tong Productions. Nothing may be reproduced in whole or in part without permission in writing from the copyright owner. For the avoidance of doubt this includes reposting or retransmission of any graphical materials from this website to other websites or bulletin boards.